February 2018 - Don Mills Builder, Inc. February 2018 - Don Mills Builder, Inc.
Entertainment Spaces: What’s Trending for 2018? Have you been keeping up with the new home trends popping up for 2018? One of the easiest ways to keep up with this is scrolling through trends on Pinterest, which, if you have been doing this, you may have noticed some home trends for entertainment spaces this year. To add one of these trends to your custom home in Greensboro, get custom home builder Don Mill Builders to design and build your entertainment space. Create a custom and open space with plenty of seating. This year has brought large entertainment spaces to the home, with a lot of available seating for during parties, sports games, and gatherings. Many of these custom entertainment areas consist of seating around the television and a dining section behind that to allow guests to enjoy their food but still have access to the event and conversation. The open spaces have plenty of lighting and typically have access to the kitchen or a small bar. Probably one of the largest trends this year is custom, outdoor entertainment spaces. Many of these spaces seem to be themed and they are not just patio spaces anymore, they are developing into their own rooms with individual designs and concepts. These outdoor entertainment spaces typically are showing walls and coverings, whether completely enclosed or partially enclosed with cutout windows to allow for an exotic feel. Ample lighting, fire pits, and plenty of furniture that resembles a more interior design are complimenting these areas. Put a cozy, intimate home theatre in your homes’ basement. Another entertainment space that is trending is the home theatre in your homes’ basement. This is not what it used to be, however, with a room and theatre seating resembling that of an actual movie theatre. This trendy space has taken a cozy, intimate feel, with plush sofas, low lighting, and surround sound or sound bars. A fun addition to custom add to your home would be a snack bar or small kitchenette in the back of the room. If you are steel feeling that old-school version with the movie theatre feeling, try modernizing it by adding a sofa to the room and ditch the over-sized television for a curved one instead. Build your custom home in Greensboro with Don Mills Builders. Do you want to add custom additions to your home or are you looking to build a home in Greensboro? With over 27 years of experience, Don Mills Builders can help you design and build your home. Call them today (336) 362-1777.
https://donmillsbuilders.com/wp-content/uploads/2017/08/DonMillsLogo-1.png 0 0 Don Mills Blog https://donmillsbuilders.com/wp-content/uploads/2017/08/DonMillsLogo-1.png Don Mills Blog2018-02-27 21:28:292018-06-20 21:31:06Entertainment Spaces: What's Trending for 2018? Is this the year you’re finally going to build your dream home? A truly exciting experience awaits you, full of planning and choosing your favorite features. When it comes to the kitchen, the heart of your home, do you want to include the most current trends for Greensboro custom homes in 2018? Consider these options to create a state-of-the-art kitchen that will bring you years of cooking, eating, and entertaining enjoyment. Your kitchen is likely used at least 3 times a day, whether it’s for meal preparation, snacking, baking, or any other activity. You will get much more enjoyment from your kitchen when functionality and convenience are taken into consideration. Strategic design. Think about the flow of movement when designing the kitchen layout. When you’re cooking a meal, you will move from the refrigerator to the counter to the stove and around the room, typically in a certain pattern. Position appliances, sinks, islands, and other fixtures in a logical layout that works for you. Reinvented Storage. Cabinets are being designed with hydraulic doors that swing up or fold away, drawers that slide out, even carousel shelving that brings the shelf you need down to your reach. Drawers with multiple levels inside can save space. Walk-in pantries are convenient for food storage, freeing up cabinet space for kitchen supplies. Automation. Automatic features are no longer just for public restrooms. Hands-free faucets and dispensers in home kitchens help avoid messes and promote good hygiene. Modern kitchens focus on practicality and aesthetics simultaneously. You don’t have to trade beauty for functionality. Some old-fashioned elements of style are coming back into kitchens lately, helping to breach the gap between modern convenience and classic beauty. Black and White. It doesn’t mean you need a checkerboard floor (although it never goes out of style). But the stark contrast of black to white between surfaces, backsplash, appliances, and accessories creates an old-world look in a modern kitchen. Bright Colored Farm Sinks. Stainless steel, white porcelain, and double-sided sinks are slowly going away. In their place, you’ll find wide, deep farm sinks in a variety of colors from subtle pastels to bold hues. Prominent Light Fixtures. Lighting makes a major style statement in your kitchen. It also needs to provide sufficient light for the task at hand. Consider bold light fixtures for ceiling lights, especially above an island or other seating areas. Then place simple, bright lighting (LED lighting is ideal) under cabinets and over stovetops and sinks. Luxury custom homes by Don Mills Builders are designed with the most up-to-date styles and options. Planning out your dream kitchen is easier with an experienced builder who can offer the latest features and modern conveniences. 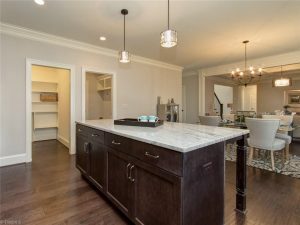 Greensboro custom homes are going up in highly desired neighborhoods in the northern Guilford County area, and Don Mills original homes are some of the best in the area. 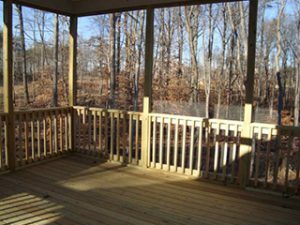 If you want a home built with quality materials and expert craftsmanship, call (336)362-1777.